Employees must receive pay for every hour worked, including work before and after a scheduled shift and time spent traveling during the workday. Legally, employers must pay at least the minimum wage. 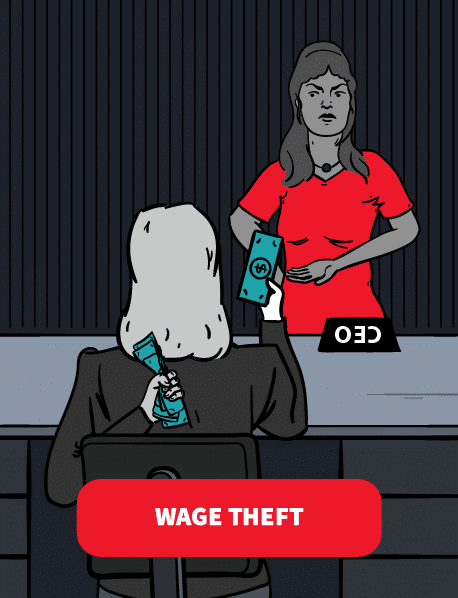 Refusing to pay minimum wage is a form of wage theft. Minimum wage laws protect workers. If you received less than minimum wage, you have legal remedies. A New York employment lawyer can help. Some states and cities set a higher minimum wage than the federal standard. In these areas, employees are guaranteed the highest minimum wage for their location. If you live in a state, like New York, where the state minimum wage is higher than the federal minimum wage, you have to receive the higher amount. If you work in New York City or the surrounding area, you must receive the highest applicable amount. Except for certain specific categories, all employees must receive the minimum wage. However, some workers are not eligible for minimum wage. The following workers are typically exempt from the laws requiring minimum wage and overtime pay. The exception for part-time companions and babysitters does not apply to those who provide nursing care, as well as home care aides who perform domestic services. These workers are eligible for minimum wage. Domestic workers who work directly for a family rather than through an agency must also receive at least the minimum wage. This includes housekeepers, child care workers, chauffeurs, and gardeners. Tipped employees are also guaranteed at least minimum wage. However, employers can pay tipped employees less than the minimum wage only if the employee’s wages plus tips divided by the hours worked equal at least the minimum wage. For more on tipped employees and wages, see the Tipped Employees page. If you are not in an exempt category, you must receive at least the minimum wage. This rule applies even if you earn a salary rather than an hourly rate. To determine whether your salary meets the minimum wage, divide your weekly average salary by the number of hours you work per week. Keep in mind that if you work more than 40 hours in a week, your employer must pay one and a half times your usual rate for any hours over 40. Make sure you deduct any unpaid time off taken during the year, such as unpaid vacation or sick time. For example, if you earn $45,000 per year, and you typically work 40 hours per week, your hourly rate is $21.63 per hour. This is $45,000 divided by 52 weeks, or $865.38 a week. Divided by 40 hours, that equals $21.63 per hour if you do not take unpaid time off. Employers may not make any deductions from your paycheck. The only exception is when the deduction is required by law or it is for your benefit. Legal deductions include Social Security taxes and income taxes. Deductions for your benefit include health insurance, pension contributions, discounted parking passes, fitness center dues, or daycare expenses. You must agree in writing to these deductions. Employers are legally obligated to give their employees written notice of their rate of pay as well as a wage statement. If your employer pays you incorrectly, the notice and wage statement are automatically deemed incorrect, and in addition to the double damages for what you were not paid, you can receive a monetary award up to $10,000 per year. Your employer must provide notice both English and whatever language you speak as your primary language. Also, your employer must get your signed acknowledgment that you received the written notice. Employers must keep your signed acknowledgement on file for at least six years, just like other payroll files. If your employer fails to provide written notice, and fails to pay your full wages, it must pay you $50 for each workday that passes without giving you the notice, up to a maximum of $5,000 for each year of employment. If your employer fails to provide you with a wage statement, or if the statement is inaccurate, and you do not receive your full wages, you can collect $250 for each day the violation continues, up to a maximum of $5,000 per year of employment in addition to twice the amount you were shorted. Thus, if your employer did not provide written notice or a wage statement, you may be entitled to an additional $10,000 per year of employment. You have two options for recovering unpaid wages. You can file a wage claim with the New York Department of Labor, which will investigate your claim, hold a hearing, and help you recover any wages your employer owes. Alternatively, you can file a lawsuit in court. You do not have to retain a lawyer to pursue either option. However, maneuvering a case through the courts is a more complicated process than filing with the Department of Labor. If you do retain an attorney, both the Fair Labor Standards Act and New York Labor Laws require that your employer pay your attorney fees if your wage claim is successful. Depending on how much your employer owes, you may be well advised to talk with an attorney who will seek to recover your maximum damages under all governing laws. You have six years to file a wage claim under state law, but only two years to file under federal law (or three years if your employer willfully violated the law). In addition to recovering unpaid wages, you can also receive liquidated damages. This doubles the amount of damages. The court calculates liquidated damages as equal to the amount owed in unpaid wages, thus the term double damages. For example, if your employer failed to pay you $5,000 in minimum wage and overtime, the court may award an additional $5,000 as liquidated damages, for a total of $10,000 plus interest and attorney fees. Although both federal and state law permit liquidated damages, you cannot collect under both.